A corps member 2018 Batch 'A' identified as Ibrahim reviewed how much he has been able to save within a period of 9 months from his NYSC allowance. He went further to tell how he was going to make use of the money after service. 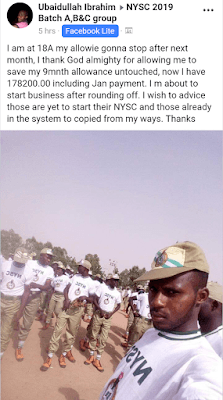 However, one will think people will applaud him, but his fellow corps members came bashing him. See how they reacted after his post!